This video demonstrates Panto Sequencing Assistance. 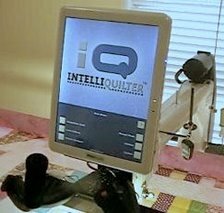 This video shows batch sequencing of a quilt - that is, setting up the stitching sequence for the amount of quilt you can stitch before advancing. If you prefer to sequence the whole quilt, then you will simply touch 'whole' rather than 'next', as is shown in the video. Use this link to watch the video on YouTube.